One of the challenges of moving to a new country is that you can’t read labels, and the foods are different. A few weeks ago, I started feeling under the weather but I did not have my normal go-to boosts. No lacto-fermented pickles, no oil of oregano, and only a little bit of ginger and some garlic. Now, one nice thing about this time of year in Israel is that the cucumbers are inexpensive, though most of their commercial pickles are too vinegary for my liking. So, because I could also not tell if yogurt was live bacteria, or not, I decided I would need to make my own kosher dills. Otherwise, I wouldn’t be able to know if I was getting the good bacteria to get rid of my illness. Now, I learned fermenting from Joybilee Farm, but that’s large batch fermenting and not only am I in a small apartment, but I don’t have a single canning jar to my name. So, the question that came to me is how can you preserve and prepare food successfully in an apartment for just one person? I started my fermented food venture with a single small jam jar, a single cucumber, three cloves of garlic, and salt. I didn’t have any dill though, but you can add dill to make them completely kosher dill pickles. Start by sterilizing the glass jar and it’s lid with boiling water. While they are cooling, slice your cucumber in even slices, and discard the blossom and stem ends. The evener your slices the evener your fermentation will be. If some slices are too thin, they may get mushy during the ferment process instead of retaining crispiness. Also, if your cucumber has sat for a while, it will not remain crisp through the fermentation process. The fresher the cucumber, at this stage, the crisper your finished pickles will be. Once the jar is cool enough to touch, stuff those cucumber slices into the jar along with the garlic cloves, and layer in some salt. If you want a stronger garlic flavor, you can slice the garlic. Garlic will remain hot even through the fermenting, so be prepared if you decide to munch your pickled garlic. For this pickling fermentation I used about half a teaspoon for a one cup sized jar. The salt prevents bad bacteria from proliferating, but you don’t want it to be too salty either. The average is a tablespoon per quart contents with pickling. After the cucumber slices, salt, and garlic are in the jar, top up with water until the cucumber slices are just covered. Leave some head-room, and put a clean piece of plastic (cut from a yogurt container for example) into the mouth of the jar to hold the cucumber slices under the water. Loosely put the lid on the jar, and set it in a shallow dish or bowl. Then, put in a visible spot on your counter. Now we play the fermentation waiting game. Depending on how warm it is you should see bubbles start within 6-12 hours in a small jar. The bubbles will start out large, and get smaller as the fermenting draws to a conclusion. You will need to “burp” the jar at least twice a day to release any built up pressure from the fermentation, otherwise you could end up with an exploded jar of pickles, which would be no fun. When the bubble production slows down, anywhere from 24 – 48 hours in a one cup jar, move your pickles to the fridge. At this point the pickles should all be an even grey-green, not the bright green of fresh cucumbers. After your pickles have cooled, open up the jar and try one to see how it turned out. They should smell like pickles, if there is an off odor, or mold developed then do not eat them. The jar was probably not sterilized enough or some other contamination happened. Lacto-fermented pickles have a slight tangy taste, but not vinegary as there is no vinegar added to the process. The tangy-ness is caused by the lactic acid produced by the lacto-bacteria, and is what shows that your fermentation was successful. For your next batch of pickles, you can add a few teaspoons of juice from your successful batch to kick-start the fermenting process with the right bacteria. In the same-size jar, a boosted batch will ferment faster if all other conditions are the same. However, if the temperature is cooler then the fermentation may take a bit longer. Enjoy your fresh pickles with an open face grilled cheese sandwich, or on a quesadilla, or just straight from the jar, for an all natural immune boost. Not to mention absolutely yummy taste! After you’ve eaten your kosher pickles, you can also use the pickle juice. Add the juice to a soup when you are stewing the bones, and it will help extract more minerals from the bones to make a healthier soup. Also pickled garlic goes quite well in soup, as it doesn’t taste pickled, it just tastes like garlic. 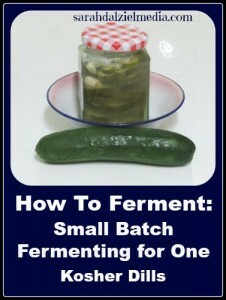 What did you think about this how to ferment food for one method? Have you ever done your own lacto fermentation, how did it turn out? Great little recipe and instructions are clear. Thanks for this its going to be interesting to try. I’m glad the instructions are clear, let me know how it turns out for you! Thanks for mentioning Joybilee Farm. I love how you adapted the Kosher dill recipe to a smaller batch and that your were able to do it in your tiny apartment, with hardly any kitchen equipment and little space. There’s some really good tips here, too. One thing, there’s nothing really “kosher” about Kosher Dills. They are dills because of the dill weed. I think the name “Kosher” got applied to them because they are the kind of pickle that you can buy in Brooklyn at the Jewish delis there. And pickles aren’t unkosher if they have vinegar. But they are certainly more healthy fermented. Glad they made you feel better.